This Stamp was an absolute must for me when I saw it in our New Autumn/Winter Mini Catalogue. So far I have created 4 different cards using the Motobike as my main focus. 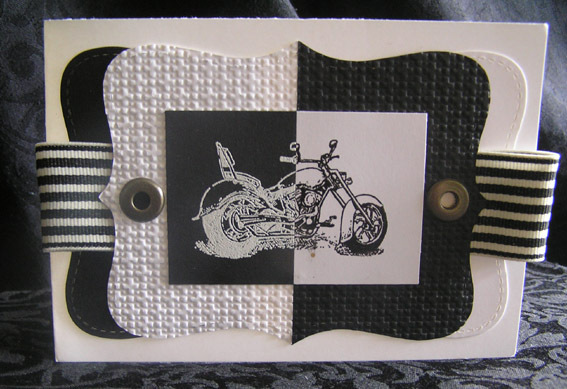 In this card I have embossed the Motobike twice and then cut the cardstock in half then I have matched the two pieces up together like a jigsaw to get the above effect. I have also cut out one black and one white topnote from the bigshot and cut them in half and embossed using the lattice embossing folder on one half of each colour. The Jumbo Eyelets and the Striped Grossgrain Ribbon have just tied the whole card together nicely don't you think??? NB: The Lattice Embossing Folder has been carried over from the Summer Mini and will continue to be avaliable to purchase.